Caprice’s casual lace up is funky and sporty. The navy patent leather uppers have a shiny metallic finish with slivers of silver running around the shoe and on the heel. The inner sole is made from soft leather for added comfort. 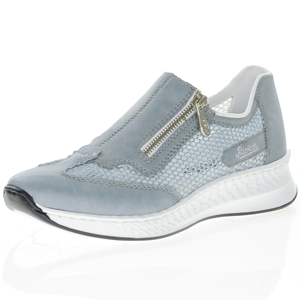 Once again, Caprice have used their ‘OnAir Technology’ in this plimsoll to give the feeling of walking on air.